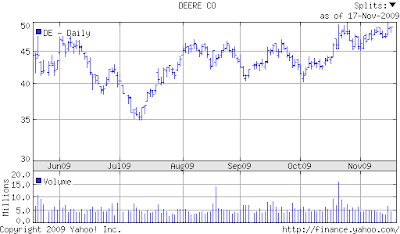 A month ago, Cramer advised viewers on Mad Money to buy CAT and sell John Deere. I took the other side of that trade, and said John Deere was a buy. 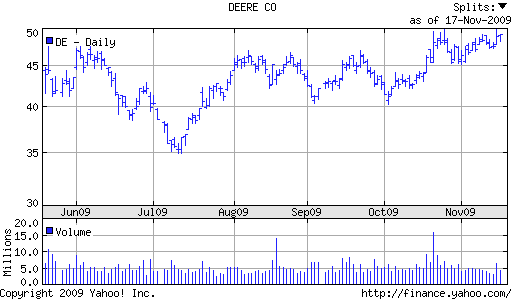 Last night Cramer said to buy John Deere. Now you have to take him at his word. And here's the John Deere play. But first, let me pimp my blog for a second. Remember when CAT had earnings in July? I touted it on July 15. Because every shill on the street was already negative on that name, or they had a hold on it. Heck I touted the August 36 calls at .88. You had a five bagger in a week, and ten bagger two weeks later! That's what happens when the street is on the wrong side. And they were just worn out. All the July buyers of calls on CAT got zip--The coin was in the August names--after they reported! It's the same with DE. The December 55s calls are less than .40. DE reports in 5 days. With Cramer's pump, you may have to pay .55 cents for these options. It's still a gift. And you should get the same result. A five or a ten bagger for putting up a half a buck. 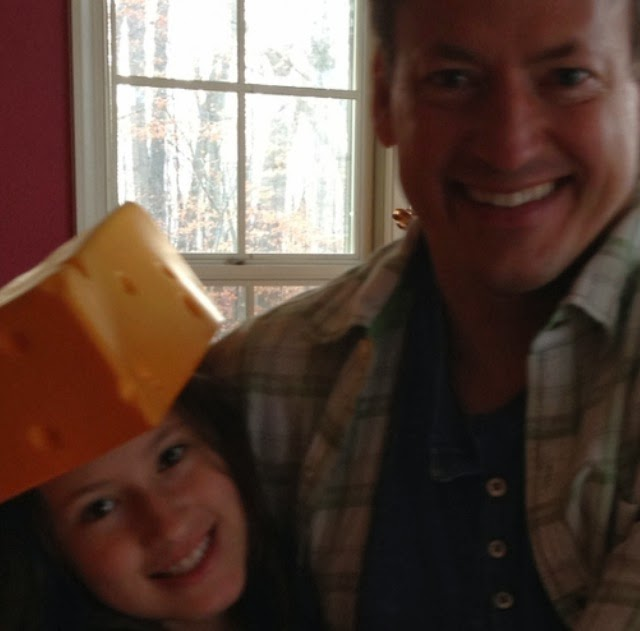 But you don't have to take my word for it, or Cramer's. Take the word of the chart. Look at the last six months. You don't think that name is ready to breakout if they report a good number, or say something positive going forward? 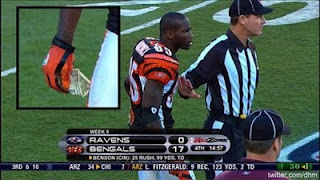 It may not beat Goodell's return on Ochocinco's dollar, but it's good action for Fifty Cents. And last I checked, his action is pretty good! i remember this post. Great Job! who is that with Ocho Cinco? Haha!! i have a new postergirl!